Paradoxes are all I am left with these days. Deepening and still being at the surface of life is a beautiful example. Old psychological mechanisms come to daylight; ready to be seen through. Some dissolve right away, others are more persistent. Both ways it is okay and they can even be funny when they persist. One of those mechanisms I have carried around most of my life is a tendency to keep others at a ‘safe’ distance even when I wish to be close with someone. This weekend I had a wonderful talk with my girlfriend about this. She has a natural tendency of being affectionate but carries an inner fear to be rejected. Combining these two tendencies is a guarantee for succesfull rejection, denial, suffering and pain and could create the most beautiful drama’s in the world when holded onto. But we just sat, watched, recognized and laughed. Now, does the dissolving of issues and a more transparent attitude toward persistent issues imply that I am able to look deeper dan before? That part of the onion has been peeled and that there is less and less of me? No. That would simply be a matter of replacing the old me with a new me that contains less psychological mechanisms than before. And believeing in such a new me that is more simple and/or tranparent could easily lead to new psychological mechanisms, as every me has it’s properties and characteristics. If it is something it does something. It doesn’t keep others at at distance anymore for instance (and hence it isn’t allowed to). Such characteristics are just new limitations which invite denial and ignorance back in my life as even more subtle mechanism than before. Where’s the next peel of the bloody onion? This peeling of the onion is a commonly spread psychological model that always promises us some kind of reward in the future. This psycholical/spiritual growth was introduced by Carl Jung and has become a widespread belief-system. And although I have always rationally oppesed it, it resides somewhere in me. But the new me that is a result of it when old mechanisms and beliefs fall away is in fact a newly created identity I put on top of the existing onion. As a result I am still stuck at the outer peel of the onion, only now it’s tricks have become more subtle and harder to recognize. When I search for a me in this presence I can’t find an ‘old me’ nor a ‘new me’. 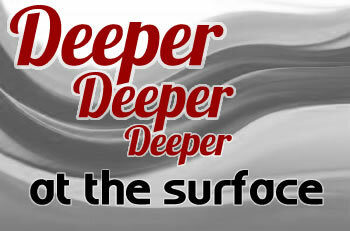 Deeper, deeper, deeper… and still my nose is at the surface. I am only here where there is only ever this: consciousness and it’s content which in fact are one. There is no deeper than that. The onion-model created a belief of something deeper that contains promises of life becoming easier. But when I look deeply into the surface of life there are no better, newer and improved me’s to be found. The presence that was here when I was still imaginarily old and unimproved is here at the same surface that reflects itself back as an unanchored point of focus. For now I call that me.